'Harry Hite' (Harry Hite by J. & G. Norrick, R. 1988). Seedling #X-4. MDB, 7" (18 cm). Late bloom. Standards beige; falls pale orchid, bottom edged beige, reddish brown veins around sides of beard; white beard tipped gold. Unknown parentage. Miller's Manor 1988. From AIS Bulletin #269 April 1988 Introducing HARRY HITE (Hite by J. & G. Norrick) MDB, 7", L. Unusual color combination. 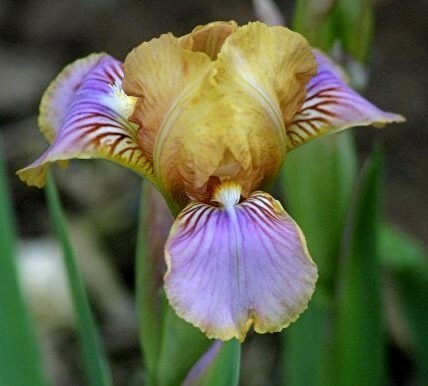 Beige standards with pale orchid falls that are trimmed beige at the tips, reddish brown veins around sides of white tipped gold beards. Branched. $10.00. Miller's Manor Garden.